This is a box created from the tips of the ostrich egg (the strongest part of the egg.) Other eggshell pieces (ostrich and emu) have been laminated to the circular tip and carved. There is a compass rose carved on the bottom of the box. The two tips are glued into a gold plated brass hinged ring so that they open much like a clam shell. Inside is a beautiful brass compass and the remainder of the inside is lined with leather of different colors. This box is lined in a gold colored leather. A small stand for display purposes is included with purchase. This is a typical inside to a compass box. The color of the leather here is gold. The compass is functional. Choose this box if you want to make a special order. You will have to let me know what you would like carved on the outside as well as what color leather you want on the inside. It is best to email me regarding your request. The interior of this box ontains a compass and is lined with leather (contact me regarding color choices available.) 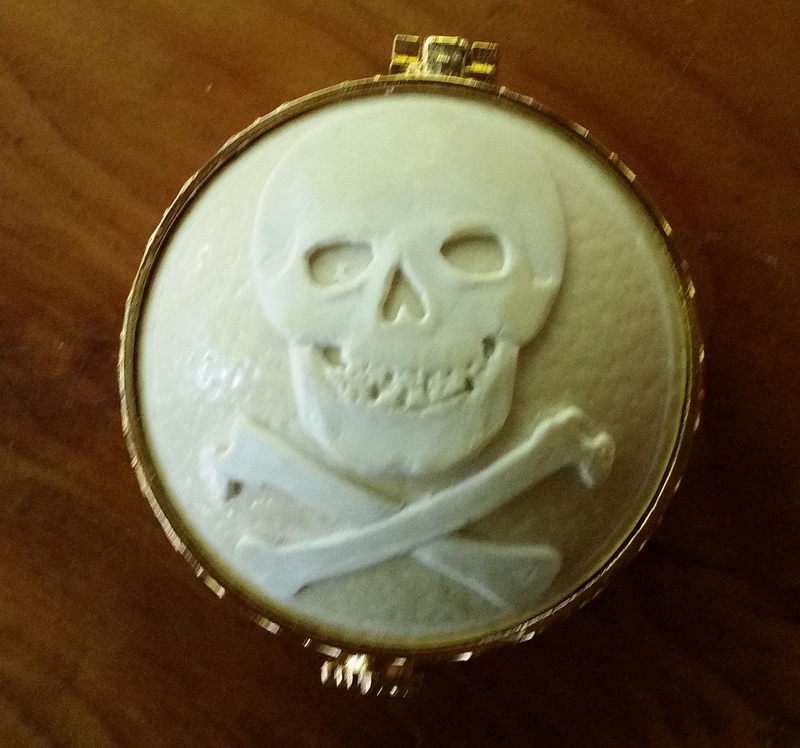 The top has a skull (which due to artistic license may vary slightly from the one pictured here) and cross bones (which may be carved into the shell beneath the skull rather than pieced on top.) The bottom of the box is ornamented with a carved compass rose. Top and bottom are in a gold plated brass hinged ring. This compass box, like the others listed here, includes a stand for display purposes. This is a box created from the tips of the ostrich egg (the strongest part of the egg.) Other eggshell pieces (emu) have been laminated to the circular tip and carved. There is a compass rose carved on the bottom of the box. The two tips are glued into a gold plated brass hinged ring so that they open much like a clam shell. Inside is a beautiful brass compass and the remainder of the inside is lined with leather of different colors. This box is lined in a dark green colored leather. A small stand for display purposes is included with purchase. This is a box created from the tips of the ostrich egg (the strongest part of the egg.) There is a compass rose carved on the bottom of the box. The two tips are glued into a gold plated brass hinged ring so that they open much like a clam shell. Inside is a beautiful brass compass and the remainder of the inside is lined with leather of different colors. This box is lined in a gold colored leather. A small stand for display purposes is included with purchase. They make the perfect gift for egg lovers or box lovers...or the perfect wrapping for that special piece of jewelry. A small stand for presentation purposes is included with purchase. The inside of this box is a peachy pink silk. If you are interested in making a special request order, email me. There are many colors of silk available, many different trims as well. You may have your own ideas for the carvings on top and bottom. You may want a mirror in the lid. In order to pay for your special request you would need to choose this curio box. A small stand for presentation purposes is included with purchase.